This microphone seems to work very well. Evidently a very capable mic, it captures both the chesty tones and the top end. All in all, it yields a nicely balanced sound." "I am so amazed how this microphone sounds. I never thought that a microphone could sound like this one. No need for compression, EQ. It's so fast - "faster than me"! With a lot of clarity, chest, dynamic and absolutely noise free. It cuts through all mixes! A killer mic! Great engineering, great work! I am very happy about this decision. No tube and power supply hassle." The currently developed model, the P250 contains a large diaphragm capsule (LDC) with an extremely thin membrane. This results in an excellent compliance, which manifests itself in a very transparent transient response. One of the major requirements for the design was that the microphone should have a perfect symmetry, without the use of a transformer, that could be responsable for distortion and ‘coloration’. After a lot of development the highest quality was reached: a microphone with a self noise that is close to the theroretical minimum and a very realistic reproduction of the entire audio spectrum. Capsule diameter : 34 mm. Frequency response : 20-20.000 Hz. 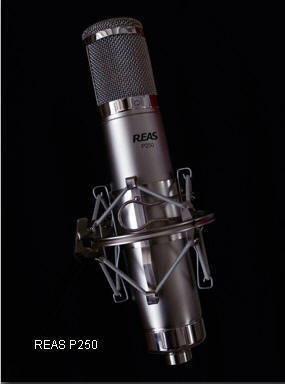 The REAS audio producs are completely hand made. All components meet the highest quality requirements.The vital parts, responsible for the quality, come from well known manufacturers. But we don’t stop here! All semiconductors are measured prior to assembly to check if they meet their specifications and only the best parts from a batch are hand picked to meet standards higher than the manufacturers specifications. Only the best parts of a batch are effectively used in a microphone. The other components also have a very low tolerance (better than 1%) and meet the highest quality standards. Only this way a high quality and a long lifetime can be guaranteed. The P250 offers a unique feature. We call it PRE-Q. It gives you the opportunity to change the HF response to your personal taste. PRE-Q is nothing like an equalizer, it is much more subtle. With a 10-position swicth, you can add a touch of extra sparkle, or dial in a more ‘silky’ top end. Once you have set the PRE-Q switch, you can simply forget about it. The P250 comes with the PRE-Q switch adjusted for a balanced HF response.